Who can resist a luscious green salad which is colored red with aromatic slices of fresh strawberries? Not us, and perhaps not you either. This recipe calls for spinach and avocado, but let us take a moment to say that strawberries are fantastic when combined with asparagus too. If you haven’t tried it, please do. What you have here is a tasty salad that is ready in less than 20 minutes, plus you can sneak in a nibble or two of a cranberry or nut while you are preparing the apple cider vinaigrette. This dressing is a simple one, and for that reason you are going to want to memorize it, because you can use it as liberally as you please, adding it to all the leafy greens that your heart desires. You can smother your sliced roast beef with your tangy vinaigrette too, or your potato salad… See? The opportunities are endless, so make it a double or triple batch and keep it in the fridge for when the perfect moment for drizzling arises. Toss in some poppy seeds or hemp seeds for a little extra crunch or a protein and enjoy every bite with the satisfaction of knowing that you are doing your body good. A healthy life starts with every meal. Keep that in mind and choose plenty of fruits, vegetables, protein and a healthy dose of beneficial fat each and every single day. 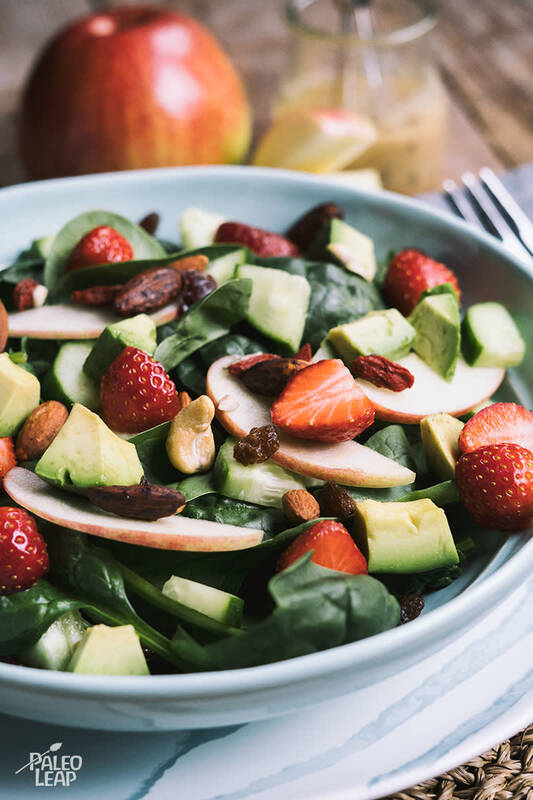 In a salad bowl combine the spinach, avocado, cucumber, strawberries, apple, and mixed nuts – toss everything gently. Add the cranberries on top and drizzle with the apple cider vinaigrette; toss everything again.